The Journey to Freedom: gate48 & Isam Nadaf second alternative Seder, the traditional Pesach (Passover) meal. Pesach in the Jewish tradition symbolizes the journey from slavery to freedom. The Hagada (the book of Pesach) tells the story of the Hebrew people as slaves in Egypt and their journey to freedom. Today, more than 3,000 years later, the Hebrew people are free, with their own nation state, but they control the lives of more than 4,000,000 Palestinians. A Jewish Mitzvah (commandment) that is related to the Pesach is והגדת לבנך ביום ההוא לאמור “, (vehegadeta lebinch bayom hahu leamor),, “and on that day you shall tell your child”. It calls every generation to tell the story of this journey to freedom. Following this tradition we will dedicate our Seder meal to the journey of the Palestinians for freedom, a journey that we as Israelis are committed to support. 2017 marks 50 years of occupation, 50 years during which Israel has implemented brutal control of nearly every aspect of the lives of Palestinians in the West Bank and Gaza. It controls their movements, denies access to their land, violates their privacy by invading their homes and more. Together with our generous host we invite you to an evening full determination for a different future. 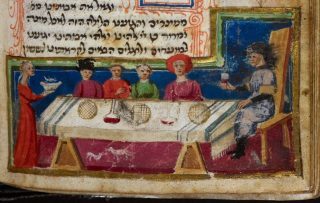 The Pesach meal is traditionally a long meal with many courses and many stories. Isam’s delicious food will be accompanied by stories from both past and present about how we can support the journey towards freedom. You are all welcome to share your personal and political stories with us around the table. Every guest that would like to speak is welcome. Your talk can be in English, Dutch, Hebrew or Arabic and we will translate this for the convenience of all. The minimum amount for a full meal of several Mediterranean courses & drinks is €30; anything extra is more than welcome. Discount is possible upon request.